Following an argument, a young girl loses her father to a boating accident, later finding a letter that contains only the words, “Dear Momo…” Shattered by guilt, she and her mother relocate to the family’s island fishing village to make a fresh start, but mysterious otherworldly forces are at work and Momo soon finds herself the unwitting companion of three oafish companions…a trio of benign goblins assigned to watch over her from “Above.” Fantasy and the everyday combine in utterly endearing fashion is this exquisite animated film written and directed by Okiura, reportedly seven years in the making with every frame hand-drawn. The technical care and craftsmanship are well complemented by a sincere and touching coming-of-age story, one whose two-hour runtime flies by with ease. 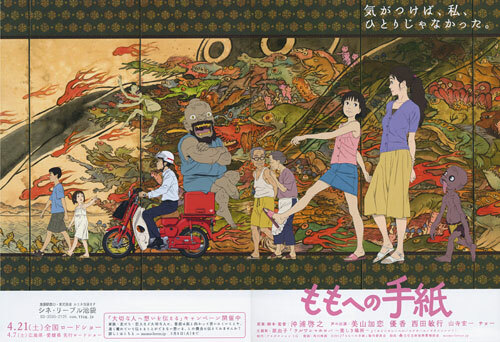 Winner of the Audience Award for Best Animated Feature at the 2012 Fantasia Film Festival.